For those who don’t know, Gamescon is an annual tradeshow held in Cologne, Germany and is, believe it or not, the world’s largest gaming event in terms of size and number of attendees. While it doesn’t come as packed with earth-shattering announcements as E3, Gamescon is a pretty big soapbox and has its fair share of exciting news. Microsoft held their Xbox conference yesterday and revealed some pretty significant things regarding their upcoming games lineup and new features for the Xbox One. Here are the 10 moments you absolutely need to know about. Halo 5: Guardians is Microsoft’s biggest title in its stellar holiday lineup and as such, they’re making a big marketing push for it. Rather than just being the next numbered entry in the series, Halo 5 is also the key to Microsoft’s push into the increasingly popular eSports market. The company put a major focus on this aspect of Halo 5 at Gamescon, announcing that the first-ever ‘Halo World Championships’ would be held this winter with a $1 million grand prize. “Halo has always been synonymous with online competition and was an originator in console eSports,” Halo 5 executive producer Josh Holmes said during the conference. “With Halo 5: Guardians we are fully embracing that legacy with the biggest investment in Xbox eSports history.” Looks like the next generation of Halo extends much further than simply adding shinier graphics. Another Xbox exclusive, Scalebound is an upcoming action game featuring dragons that is being developed by Platinum Games, the revered studio behind such titles as Bayonetta and Vanquish. Having dragons in a game is already a huge benefit, but it was also revealed that the game will have a 4-player co-op mode. Given that the game’s holiday 2016 release window is still a ways off, it’s a bit too early to tell whether Scalebound has what it takes to stand toe-to-toe with other AAA games, but the Devil May Cry meets How To Train Your Dragon concept has us intrigued regardless. While early access programs like Xbox’s Game Preview feature, which allows users to purchase games before they are officially finished and released, have received their fair share of criticism, it’s at least opening the door for more neat PC titles like Compulsion Games’ We Happy Few to come to the platform. We Happy Few is a survival game set in an alternative 1960s England that looks incredibly creepy and trippy. Sony better watch out or else they’re going to lose their Indie game cred to Microsoft pretty soon (although to be fair, it sounds like the game will be coming to the PS4 at some point). Although adding DVR functionality to the Xbox One is a nice feature that expands the console’s multimedia capabilities, excitement for this addition needs to be tempered. While Xbox One DVR will allow users to record over-the-air programming, it will not work for cable and satellite programming, which hampers the usefulness of the app quite a bit. Still, it’s good to see Microsoft committing themselves to adding new features to the Xbox One and this will surely be a useful addition for cord-cutters who get most of their programming over-the-air anyway. It’s great seeing awesome PC games make their way to consoles and Microsoft revealed that one of the year’s best PC games, Cities: Skylines, will be coming to Xbox One first (no word yet on when the PS4 port will hit). The city-building simulation received critical praise when it was released in March for Linux, Mac, and Windows PC, and is considered by many to be the game that the notoriously-lackluster SimCity reboot should have been. Chalk this up as yet another coup for Microsoft against Sony, in a year that is increasingly being dominated by exciting Xbox news. Crackdown was one of the Xbox 360’s earliest success stories and many gamers became instantly addicted to the titles’s orb-snagging parkour gameplay. While the 2010 sequel wasn’t as well-received, many fans have been anticipating a return to the open world series, especially on next-gen hardware. 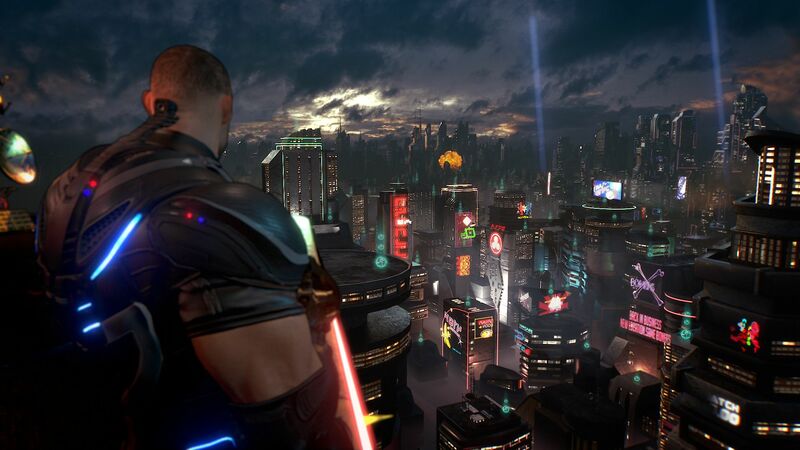 While the first trailer for Crackdown 3 doesn’t reveal many significant changes to the formula established in the first game, it looks like an excellent distillation of what made that first game so memorable. Death-defying jumps, transforming vehicles, tons of agility orbs to collect…this is what Crackdown is all about and Crackdown 3 looks like it’s shaping up to be a faithful return to the series. Multiplayer with fully-destructible environments? Color us intrigued! Quantum Break is one of Microsoft’s most anticipated exclusives for the Xbox One, so naturally it featured heavily in their conference. Developer Remedy Studios not only showed off an impressive trailer that, among other things, shows off a noticeable graphical upgrade from previous showings but also revealed that the game will be available on April 5, 2016. This time-manipulation third-person action game starring Shawn Ashmore (X-Men) and Aiden Gillan (Game of Thrones) looks like it’s trying really hard to be one of the best story-driven games of 2016. Let’s hope it delivers on that promise. Dark Souls 3 was officially announced at Microsoft’s E3 conference back in June, so it makes sense that it showed up again at the Gamescon event. Instead of an announcement trailer, this time Microsoft brought out the big guns with a thrilling gameplay trailer. At this point, you pretty much know what to expect with the Souls games: extremely difficult, but rewarding gameplay delivered in an awesomely gruesome fantastical setting. Given the enormous popularity of Souls developer From Software’s Bloodborne on the PlayStation 4 earlier this year, Dark Souls 3 is poised to be the biggest game in the series yet. We can’t wait to start dying all over again. The big mic drop of Microsoft’s E3 press conference was when head of Xbox division Phil Spencer took the stage and announced that the Xbox One would become backwards compatible with Xbox 360 games later this year. While we’re still waiting for the full feature to be rolled out, Microsoft provided some more details about what to expect in the coming months. The biggest news was that all future Xbox 360 offerings featured in the ‘Games with Gold’ monthly program will be backwards compatible, which means that Xbox One players will be able to enjoy all 4 titles released each month on one console now. The company also revealed that all Microsoft Studios games and a number of titles form major publishers such as Bethesda, Electronic Arts, and Ubisoft (see the full list here) will be supported by November of this year. The biggest surprise of the Xbox conference was arguably the announcement that Halo Wars, the 2009 real-time strategy Halo spin-off, will be getting a sequel on Xbox One and Windows 10 next year. As original developer Ensemble Studios was shut down prior to the original game’s release, development duties are being handled by The Creative Assembly this time out. Given the pedigree of The Creative Assembly’s Total War strategy series, it seems that Halo Wars 2 is in more than capable hands and should be a standout title in Microsoft’s fall 2016 lineup. Still, the first Halo Wars wasn’t a sales juggernaut by any means, even if it is the best-selling console RTS of all time. Evidently, Microsoft is confident in the potential of a sequel, given that they are releasing the game on PC as well, a platform that is traditionally much better-suited to the RTS genre than consoles.